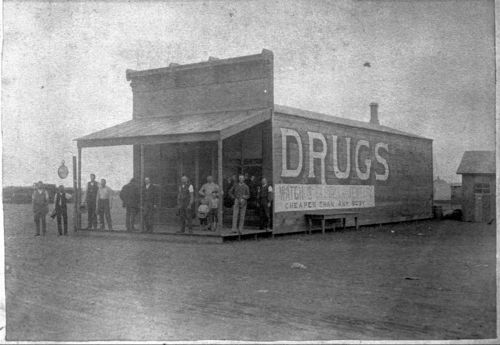 This photograph shows the exterior view of the Campbell Drug Store in Claflin, Kansas. Besides advertising for drugs, the sign on the side of the building also advertises "watches, clocks, jewelry cheaper than any body". Ten men and two boys are standing in front of the building. Holding Institution: Paul Gibler, 1961.